You know you love barbeque ribs, but have you stopped to consider all the different types of ribs and ways to prepare them? There are beef and pork ribs, and within those two categories, there are many cuts that each call for unique preparations. These ribs can be braised, roasted, barbequed, slow-cooked, oven-baked, and more. You’ll find all these types of recipes — from quick-cooking country style ribs with chimichurri pesto and jicama slaw to brown sugar rubbed ribs with mustard BBQ — and more below. St. Louis style ribs feature more fat than other cuts, meaning they hold up well to sharp flavors like tangy mustard BBQ sauce. You’ll love the salty, sweet, and tangy combination of these brown-sugar rubbed ribs with mustard BBQ, we promise. All you’ll need for your St. Louis style ribs is a simple rub of brown sugar, garlic, cumin, chili powder, salt, pepper, apple cider, and whiskey. For the mustard barbeque sauce, you’ll need garlic, ghee, onions, cider vinegar, apple cider, straightforward yellow mustard, ketchup, honey, cayenne, and cumin. These simple ingredients combine to one flavor-packed, messy meal. Dig in. Short ribs hold up well to low and slow preparations, so the slow cooker is the ideal tool in these savory slow cooker short ribs. A bit unlike their barbeque counterparts, these short ribs are beefy and rich and recall pot roast with carrots, celery, and onion. Apart from veggies and short ribs, all you’ll need to throw into the slow cooker is some dry red wine, chicken broth, and a bay leaf. Serve these atop a bed of creamy mashed potatoes, or mashed cauliflower for a low-carb, Paleo option. Beef short ribs may often be prepared to carry more traditional, pot roast-like flavors, but these slow-baked boneless BBQ short ribs prove that barbeque flavors are still on the table. These slow-baked short ribs are coated with an easy, homemade barbeque sauce made of ketchup, dark brown sugar, cider vinegar, Worcestershire sauce, Dijon mustard, chili powder, garlic powder, and cayenne pepper. They roast for a total of three hours, developing deep flavor and growing uber-tender. Yum! Chimichurri pesto and jicama slaw may not be your go-to when you think of ribs, but you’ll reconsider once you’ve tried these boneless country style ribs with chimichurri pesto and jicama slaw. Unlike slow-roasted or smoked ribs, these boneless country style ribs come together in under an hour (minus marinating time). The ribs are rubbed simply with paprika, onion powder, garlic powder, salt, and pepper, then seared and baked quickly. Meanwhile, you’ll make a chimichurri pesto, full of bright Latin-inspired ingredients like Cotija cheese, lime, and cilantro. A quick jicama slaw with pear vinaigrette comes together easily, with jicama, carrots, cabbage, scallions, and a pear-nectar based dressing. Fruity barbeque sauce prevails in this oven-baked baby back ribs with chipotle pineapple BBQ sauce recipe. Despite the long name, these baby back ribs are fairly easy to put together. The ribs are rubbed with ancho chili powder, smoked paprika, smoked salt, and cinnamon. A little bit of orange juice helps cook the ribs and add fruity flavor, while a barbeque sauce made with pineapple adds even more. To the pineapple, you’ll add onion, garlic, chipotle puree, brown sugar, white vinegar, and olive oil. Have you ever thought to use a green curry-based marinade on your ribs? If not, you need to give these coconut curry ribs a try. St. Louis ribs typically require lots of moisture for tenderness, so this super saucy marinade is perfect for providing moisture, while a special curry basting sauce locks in flavor. For the marinade, you’ll need coconut milk, cilantro, green curry paste, coconut aminos, lime juice and zest, garlic, fish sauce, and salt. For the basting sauce, you’ll need a similar blend of green curry paste, coconut milk, garlic, coconut aminos, and hoisin sauce. Nothing could be easier than throwing some ribs in the slow cooker, which is just what these sweet and sour slow cooker ribs have you do. Simply dump a sauce of maple syrup, coconut aminos, sherry vinegar, and liquid smoke in the crockpot. Rub down your ribs with onion powder, garlic powder, smoked paprika, ginger powder, dry mustard powder, brown sugar, cayenne, salt, and pepper. Place them in the crockpot and cook on low for four hours. To make a thick sweet and sour coating, pour the cooking liquid in a pan and reduce until thick and luscious. 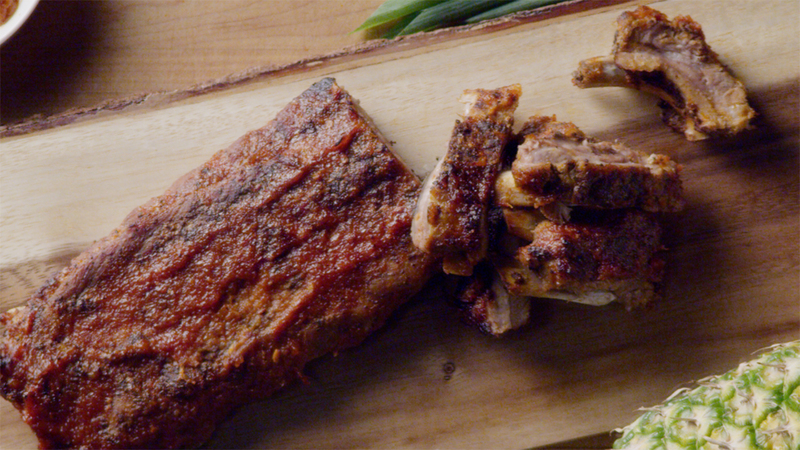 Rub all over the ribs and broil for extra crispy texture and rich flavor. These oven-baked St. Louis style ribs really couldn’t be simpler; if you’re looking for a recipe that lets the natural flavor of the meat shine through, this is the one. Simply combine coconut sugar, salt, and pepper and rub down the ribs. Cook for nearly three hours, then broil for an extra crispy texture. You can, of course, serve these with your favorite barbeque sauce if you’d like.